three workpackages are dedicated to human locomotion modeling. They follow a same methodology: protocol definition, data acquisition, data analysis. The cases of study deal with navigation in empty spaces, obstacle avoidance and people interactions. Modeling represents 45% of the effort. a workpackage is dedicated to the integration of locomotion models within algorithmic paradigms to plan and control motions for anthropomorphic systems. Algorithms represent 20% of the effort. 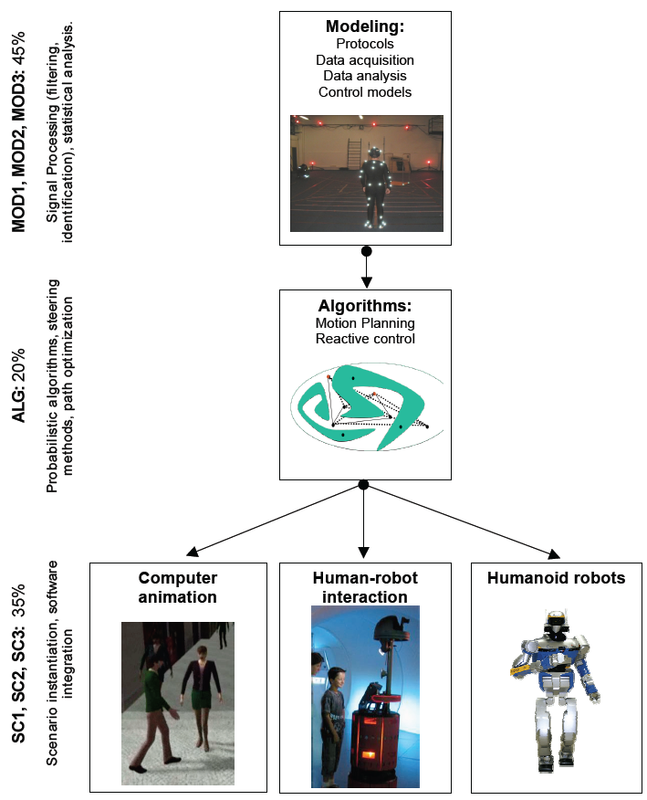 the research performed will be steered by three demonstration scenarios dealing with computer animation (15%), human-robot interaction (10%) and humanoid robotics respectively (10%). IEEE IROS, Saint Louis, USA, 2009.